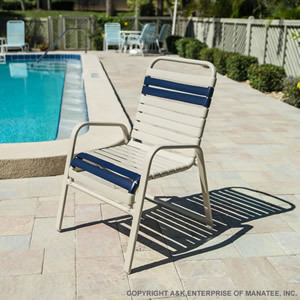 The R50 Flat Arm Strap Patio Chair is an elegant pool dining chair featuring our flat aluminum extrusion for the armrests. Featuring a powder-coated frame and double-wrapped 2 inch straps, the R50 Flat Arm Strap Patio Chair stacks easily and handles the rigors of commercial outdoor use. This classic patio chair pairs well with any of our flat-leg table styles and the R165 Flat-Arm Chaise Lounge. Make it your own with a custom frame/strap color combination.